Dr. Singson is one of the best Gastro docs I’ve ever been to. She’s very knowledgeable and thorough and I alwaysfeel that she’s invested in me as a patient. I would highly recommend Dr. Singson to anyone looking for a new GI doctor. Dr. Singson is one of the best Gastro docs I’ve ever been to. She’s very knowledgeable and thorough and I always feel that she’s invested in me as a patient. Iwould highly recommend Dr. Singson to anyone looking for a new GI doctor. Dr Singson was amazing. She listened to what I had to say, was empathetic and took her time with me. 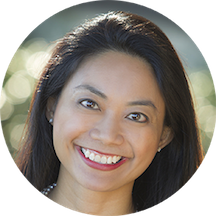 Dr. Zarema Singson is skilled in all areas of gastroenterology with a special interest in inflammatory bowel disease, colon cancer prevention, women’s GI health, hepatology, and obesity as it relates to GI disorders. After receiving her medical degree from the UT Health Science Center in San Antonio, Dr. Singson went on to complete her residency and fellowship training at the University of California Irvine where she served as Chief Resident and received an award for her research on innovative methods in polyp detection and analysis. Her passion for medicine was first ignited by her father, an internist, who continues to be a source of inspiration for her today. “I enjoy the clinical challenges in gastroenterology and also like the fact that it blends cognitive with technical skills.” Dr. Singson is excited to be back in San Antonio and looks forward to building relationships with her patients and her colleagues. She and her husband are the proud parents of two amazing girls. When she is not practicing medicine, she enjoys traveling, cooking and spending time with her family. Listened to my concerns, answered every question I had. Attentive! Excellent provider!!! I appreciate her empathy for my concerns. She is very thorough and I trust her expertise. I really like Dr. Singson. She never makes me feel rushed and she listens. I wish she was my primary care doctor! Either way I’m glad I am in her care! You will not regret choosing Dr. Singson. I cannot day enough good things about her. I love Dr. Singson, she is very caring about her patients, she only wants the best for them. I never feel rushed with my appointment. She takes the time to answer any question, or concerns you may have. I highly recommend her. Love her! Very thorough and very professional! Dr. Singson is amazing! She is extremely knowledgeable and great at what she does. I've come in to see her a few times and always have a great experience. It was only my first visit. However, she was attentive, listened and very straight forward. An excellent Dr, very thorough, knowledgeable & courteous. Dr. Singson was so sweet and down toearth. Everyone was very friendly. Cathy who drew my blood for labs has the softest touch and greatest sense of humor. I saw Dr. Singson today for a follow up appointment. Her assistant, Norma, saw me first and took vital signs. weight and we discussed my medications, etc. Later Dr. Singson came in and asked all the pertinent questions. She then maderecommendations for tests she wanted done and told me she wanted to see me in May after the testing was done. She was very professional throughout the visit. Dr. Singson was very easy to talk to and her down to earth demeanor was a welcome change in healthcare. Very thorough and explains very well. Dr. Singson was receptive to my concerns concerning my new diagnosis: Gastroparesis. Her listening was attentive and professional. I appreciated that. She also gave me insight about coping as well as trying to adjust to this diagnosis. Excellent. My appointments with doctor Singson : she is very professional, knowledgeable, polite and she knows what she is talking about. And she really wants to help the patience. I do have a lot respect for here. Dr. Singson is always in a happy mood. She always allows time for any questions we might have and answers them patiently. Absolutely love her! She talks to me and listens to what I have to say. Outstanding, she explain the procedure step by step. Made me feel comfortable. She was super sweet and patient with me. I have a procedure with her tomorrow and I can't wait to get things done. She was very reassuring that everything would be fine and I will be in great hands. Dr. Singsong is great! I saw her for the first time and she was thorough, nice and explained everything clearly. I really appreciate her kindness in fitting me in to her schedule knowing that I am 3 hours away and can't come in except on specific times. One of the nicest doctors I’ve seen. Addressed all issues and I didn’t feel like she rushed the appointment to get to other clients. Highly recommend!! Dr. Singson is amazing! She takes her time to really listen and be as thorough as possible! Very professional. Courteous. Timely. Informative. I loved her. She was professional and asked me so many questions about my problems, which helped me remember things. She gave me several options for going forward with treatment and I liked that. She got on the computer and foundmy last colonoscopy when the nurses had not been able to do so. She was very professional and caring. A doctors visit is never pleasant. I was extremely surprised when I arrived to see so many patients waiting. This is normal with 9 other doctors. Still I expected to wait! I was called back immediately! Dr. Singson explained everything andfor the first time in years, I now understand my exact issues. I was pleased with the staff and feel I have made an excellent choice for my new doctor - Dr. Singson. I found Dr. Singson very approachable, easy to talk with, warm, and informative regarding my condition. Dr.Singson was very friendly, interested in me, knowledgeable, patient, answered all my questions. Although I've seen her only two times, I would recommend her to anyone seeking a good gastroenterologist. She was recommended to me by my urologist. The personnel in her office were also friendly, helpful and patient. Great visit. I felt like my input was important. I cannot wait to go back! I was very pleased with my session with Dr. Singson. She was thorough, professional and seemed truly interested in my welfare. I was especially please at the wait time to see her--20 min. in the waiting room and 5 min.in the exam room. The normal wait time with my other Gastro Dr. was 2 to 3 hrs. That is the reason I made the change to Dr. Singson and I am very pleased with the choice I made. Dr. Singson explained every thing thoroughly. When she finished, she asked if I had any questions which I did. She took the time to answer and explain everything. Dr. Singson was very friendly, easy to talk to, made me feel as if she was not in a big hurry to end this visit and totally professional! I know I am going to love seeing her at my appointments. Irecommended her to 5 of my friends ! Three of them already have appointments!! 5 stars!!! My overall experience was great. The nurse and doctor talked to me not at me. They both made conversation that was not appointment related to make me feel at ease. Dr Singson explained my options and the process of each. Shemade my decision easy. I would highly recommend this visit to all. My doctor was incredible. I've cancelled and missed my appointments trying to get in to see her. Despite that she emergents got me in the next day as a new patient for my symptoms. The ladies at the front desk weresuper helpful and understanding with my schedule. I barely sat in my chair before I was called back. The doctor walked in immediately after the nurse walked out. The doctor was very professional and answered all my questions! I am very satisfied snd vrry hapoy to have Dr. Singson as my doctor. She is awesome. Her staff sre so friendly and you can tell they follow her lead. Kudos to corina as well. She is awesome. So good withthe patients. I highly recommend to l my friends and relatives to use Do ctor and her staff if they need someone in their profession. Love how she takes the time to listen and encourage. No chastising. She is very personable and knowledgeable. She is a great doctor. As always, a highly professional and caring attitude from Dr. Singson and the staff. Since my first appointment over the phone the lady was very nice. My visit to the doctor I treated very professional. Highly recommended.